Commander is a leading-edge ON /OFF helmet in Airoh® composite fibre. Characterised by an attractive look and advanced technical solutions, Commander is particularly suited for an all-terrain, all-round riding experience. It can be used in two different configurations, i.e. with peak and visor for all-road use, or with visor and no peak on naked bikes or for on-road use. All of the latest Airoh technologies come together in this model without rivals that ensures comfort and total protection, even in the most demanding situations. 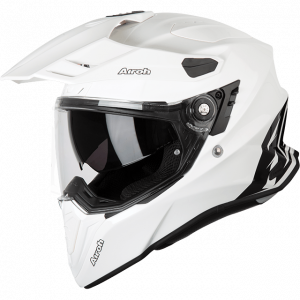 An extra-wide visor with an integrated Pinlock® lens, a three-point ventilation system, an aerodynamic peak, a retractable sun visor and the opportunity to connect Bluetooth systems are only some of the extraordinary features of Commander. This helmet has neat lines that will help you push through all the bends of your journey without any difficulty.